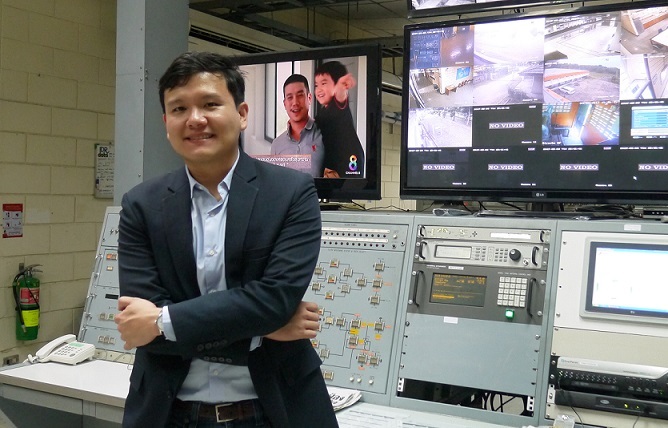 James Yenbamroong, CEO of mu Space Corp.
mu Space Corp is a Thai space startup founded in August 2017, that is working to deliver satellite-based broadband, mobile, and broadcasting solutions across Thailand. Besides operating its own satellite, the company aims to become the first to offer commercial space tourism in Asia-Pacific. Recently, at the International Astronautical Congress (IAC), mu Space made headlines by being the first Asian space company to pick Blue Origin as its launch partner. In an exclusive interview with CEO James Yenbamroong, SpaceTech Asia finds out more about mu Space’s activities and plans. I’m Thai. I have educational backgrounds in Aerospace and Mechanical Engineering from the University of California. After my education, I worked with Northrop Grumman. I was a project lead for unmanned vehicle systems. I was involved in technical and budget planning, and system production and analysis. After years of working in the US, I went back to Thailand. I founded mu Space Corp in 2017. The top reason is, I want to improve the quality of life. Satellite systems can be used in a number of ways. Among others, it is commonly used today for weather forecasting and emergency response communications. Everything that can be seen from space can be an invaluable source of information for governments to plan smart cities more efficiently. Satellites can be used to map city landscapes, monitor environments and analyze carbon footprint. These satellite applications are becoming essential to the delivery of sustainable urban societies and in making our quality of life better. We’re a group of 15 now, but we’re expanding operations rapidly. I’m bringing more space professionals to the team. I plan to have 30 staff early next year. We’re busy closing deals with Thai telcos to provide satellite-enabled broadband and mobile networks in rural Thailand. The local government has recently approved the rollout of a 14 billion baht (422 million USD) nationwide project to connect 3,920 remote villages to broadband and mobile. To fully implement this project, the government will need a telco who can provide a satellite network for rural areas. We want to be that satellite service provider. How are you working with the Thai government? We’re helping the Thai government in their digital projects. Last month, we signed a partnership deal with the government’s Digital Economy Promotion Agency (DEPA) to help develop the country’s Digital Park, a high tech space that will have a super-fast broadband infrastructure, submarine cable station, data center and satellite earth station. Read the full story here. What kind of a satellite will you have, and who will manufacture it? It’s a high throughput, Ku-band geosynchronous satellite. We will provide satellite backhaul for broadband, mobile, broadcasting, IoT devices and smart city apps. We’re still looking at different options [for satellite manufacturers]. One thing is certain; we’ll use Blue Origin’s New Glenn space vehicle to launch the satellite. Why did you decide to go with Blue Origin for your geostationary satellite launch? What we like about Blue Origin is their concept of a reusable rocket. It is a major breakthrough in space technology. We expect that with this system, launching a satellite would be cheaper in the future. What do you think of the Thai space industry at the moment? In terms of competition, aside from us, there’s another Thai satellite operator — THAICOM. They are known in the telecom industry because they were established since the 1990s. We’re still new in the market so we have to invest extra time and energy to promote and prove to business clients that we have better quality services at reasonable costs. What about the Asian space industry in general? The space industry is still new in the region, but it’s growing rapidly with China, India and Japan leading the industry. The 21st marks the beginning of space race in Asia. China launched in 2003 Asia’s first spaceflight. From that time on, more and more Asian countries joined the race. I’m optimistic that Asia will achieve more global “firsts” and will be more competitive in years to come. When do you think space tourism will be commercially viable, and what will your role be? After 2020s is a realistic timeline. We have a similar concept with other companies offering the service. We’ll send space tourists to the International Space Station. After a few hours or a day, they’ll return back to Earth. We will provide them with advanced space suits, gloves and other gadgets to ensure their safety in space. What makes mu Space unique is our target customers. We want to be the first to offer space tourism in Asia-Pacific.